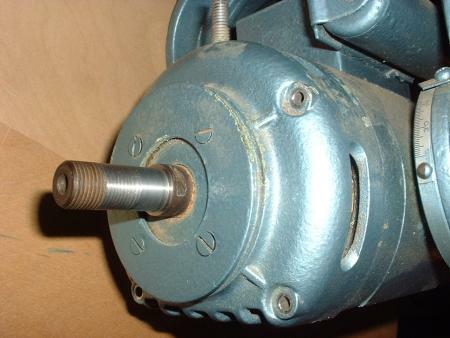 Motor bearing replacement in the MBx DeWalt Radial Arm Saws is a fairly straightforward procedure. There are a couple of areas to look out for, however. 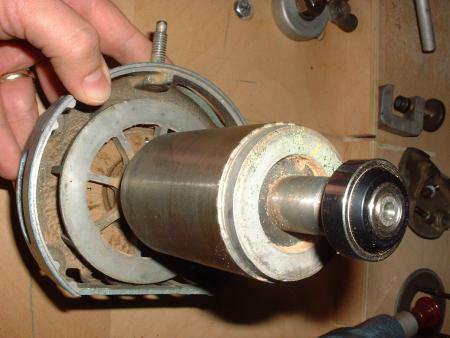 Here is a guide to what you'll see when you open up the motor on your saw. 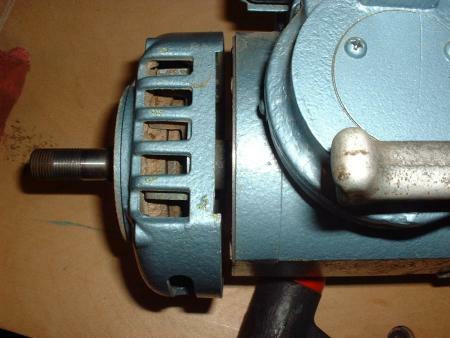 This article demonstrates motor bearing replacement in a MBF, but the other MBx saws should be very similar. Please add to or edit this article to point out any differences in models, correct any errors, or clarify anything that could be better stated. A Japanese JAF 88500 was used to replace the Fafnir 200KLL2 on the cord side and a Japanese IKS 88504 to replace the New Departure C 88504 on the arbor side. 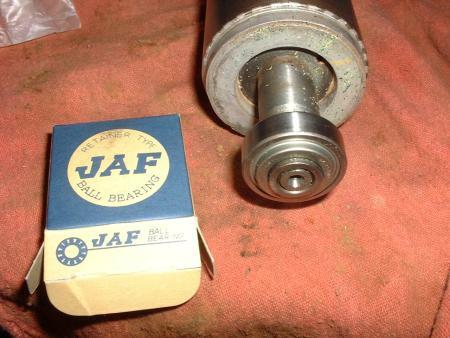 These bearings were ordered from Accurate Bearing and are fairly standard. The motor/yoke was pulled off the arm and the end bells unbolted. The circular plate with the four slotted screws came off next. This plate screws to a similar plate inside that holds the bearing in the end bell. With the bolts out, the end bells rotate freely. Of course you don't want to get wild with the cord-side, but the arbor-side is fair game. 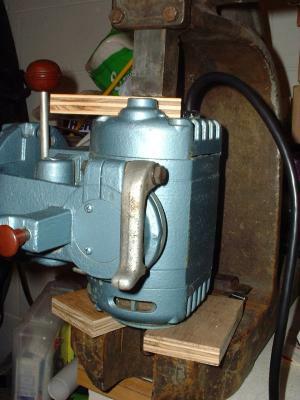 You can rotate the arbor-side a bit, then tappity-tap-tap along the motor's flat bottom on the exposed part of the end bell with a soft mallet. Rotating back and forth and tapping along, the end bell came off without much resistance. There is a snap ring holding the arbor side bearing in place. 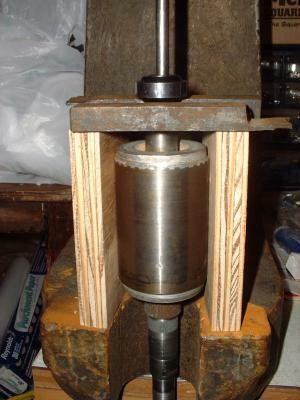 Work it off of the shaft, then prepare to remove the bearing. 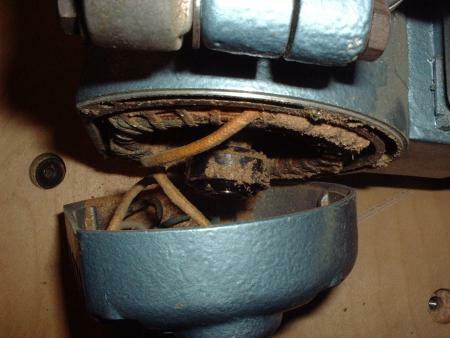 Your options are somewhat limited here as the fan and the retaining ring leave very little clearance behind the bearing. One option that was suggested would be to take two threaded rods, screw them into the bearing retaining plate and use a bar puller to get the bearing off. If I didn't have an arbor press, I may have gone that route. 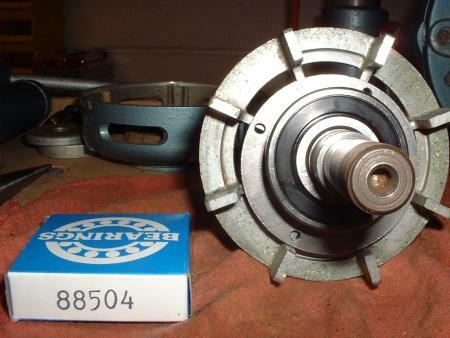 One possible issue with doing it that way is that the bearing retainer plate doesn't give much support around the bearing for that sort of operation. It may have just flexed, damaged the bearing, and made the job more difficult. I did try to reattach the front bearing plate, then use a puller attached to that front plate, but it didn't want to give easily and I didn't want to force it. The parallels are bearing against the ID of the fan. I've seen many reports of these fans breaking upon removal, so be careful here. 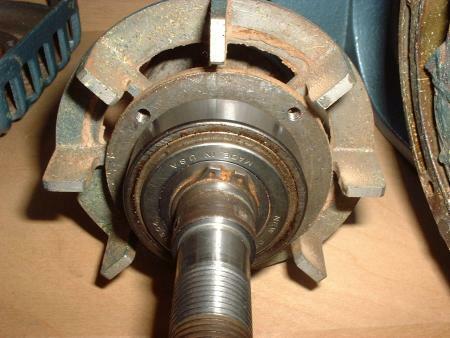 The shaft where this bearing is installed is stepped/tapered, which doesn't expose much of the ID of the bearing. The setup that I used destroyed the bearing, but it came off cleanly. 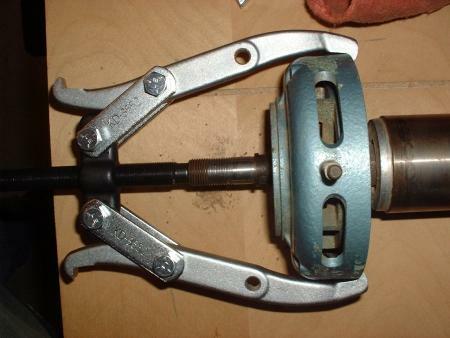 With a proper bearing splitter, pulling it without damage may have been possible. After that, press the new bearings on. I pressed the arbor side bearing, ring, and fan back on as an assembly. 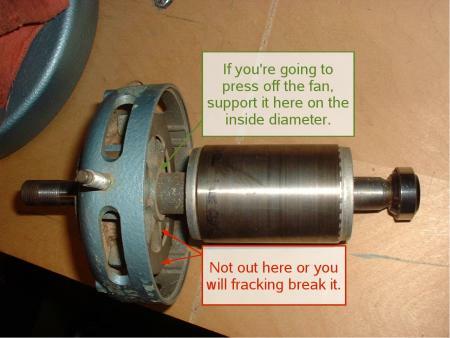 Pressing them all on at once allowed the ID of the fan to bear directly against the ID of the bearing, providing proper support. To get the arbor-side bearing back in the end bell, I warmed up the end bell under a lamp for a while. The bearing almost fell in place. With each of the end bells, getting everything to go together straight took some time. They wanted to go onto the bearing crooked and bind. 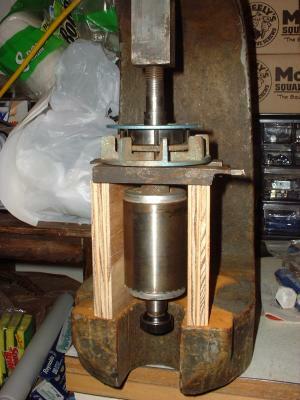 I ultimately used the arbor press to finish pressing the end bells back onto their bearings. This really doesn't take much force, but putting everything in the press prevents racking and keeps everything nice and straight. With new bearings, the motor in this MBF runs great.